Adore Beauty is an official Designer Brands stockist. Since 1996, Designer Brands has been Australia's leading cosmetics brand to prove that affordability doesn't mean compromise. Designer Brands was created to challenge the notion that high-end was the be-all and end-all of quality. After living in America and noticing that Los Angeles women always looked flawless in inexpensive clothing, but inexpensive in beauty tended to mean poor quality, a husband and wife team invented Designer Brands on the back of a napkin, and moved back to Australia to launch 15 products. 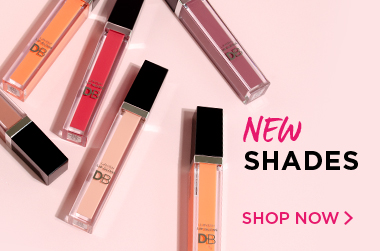 A decade later, Designer Brands is now found in four thousand pharmacies across Australia, pioneering quality affordable makeup inspired by trends yet maintaining a classic, timeless edge. Designer Brands is proudly free from parabens, talc and bismuth. On top of that, DB have also obtained Vegan and Cruelty Free Certifications across the entire makeup range. Showing 20 products of 49. I mean- for the price, this eyeliner is such a winner! It's easy to apply and stays put all day. It really doesn't smudge but it easy to remove at night. Love it! Would definitely repurchase. This was the first contour kit I bought and it was perfect while I was learning what this contour business was all about and didn't want to spend much money. It's easy to use, blends well and comes with handy instructions. It's not as pigmented as some of my others but personally I think that's ideal for a beginner as you don't want to end up putting on too much and looking muddy. I still keep this in my desk at work for touch ups- the highlighter is nice dabbed onto eyelids too. Onto my third bottle of this genius product. Will never swap it for anything else. Have searched high and low for a product like this and nothing has ever come close , not even the much more expensive brands. Amazing feel, amazing base for foundation and not oily. Definitely recommend!